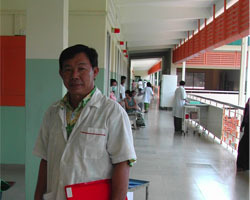 Since mid 2004, with the support of the United States National Institutes of Health (CIPRA) program, the French ANRS and private donors, CHC has worked in the Khmer Soviet Friendship Hospital, the major public inpatient facility for patients with TB and other lung diseases in Cambodia and the largest public hospital in Cambodia. With funding for renovations from the NIH and the Japanese Embassy Grass Roots Fund, and with CHC daily assistance, the pulmonary ward was transformed from a dismal place where impoverished patients came to die to a functional ward. It served as the major clinical site of the recently completed NIH and ANRS-supported clinical trial CAMELIA . It is currently a facility where impoverished TB and AIDS patients receive excellent care and it has become a 'Center of Excellence' for TB and AIDS care in Cambodia serving a training site for students and nurses from the country. The 120 bed ward is divided into 4 sections including a section for TB and a section for patients with both TB and HIV. Active CHC clinical presence (physician and nursing and ward management assistance) on the ward began in 2006 with the initiation of CAMELIA. From January 2006 to 2009, 3603 TB patients and 1035 TB and AIDS have been treated there with CHC's assistance. 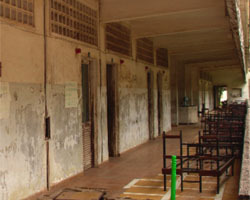 When CHC initiated care for drug-resistant TB in Cambodia in 2006, the pulmonary ward became the first site in Cambodia to have isolation rooms for infectious patients initiating therapy and now has 20 isolation rooms available to serve the drug-resistant TB patients admission at any one time.